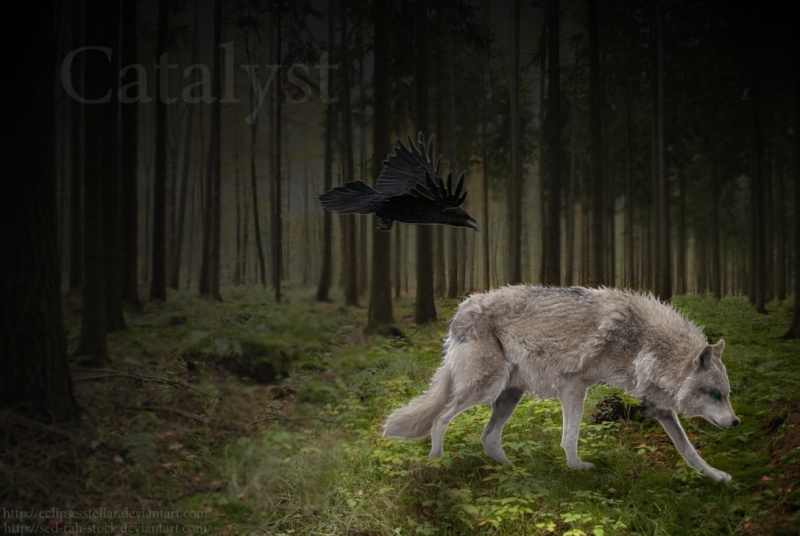 Catalyst-Wolves is now open for all to join and post! Anything related to Out Of Character discussions are welcome here, from saying hello to your fellow members, talking smack about your most hated show or even something you have in mind for future Role playing events and idea's. All we ask is that you're considerate of each other, otherwise, have fun and feel free to tell us what's on those creative minds of yours! Here you will find general information about the site along with the rules. Everything is broken down to allow a smooth navigation around our forum. Got Suggestions or is there something you're having trouble with? Post it up in here and your Administrative Team will get on the job as soon as humanly possible!...Unless they're wolves...In which case...Well...You get the point! Announcements regarding the forum and Pack/s residing on site, up and coming events and plot details, given to you by your Admin here. Create your character here after creating an account by following the form provided. Be sure you have read through our rules before joining. A member of our administrative team will review your application and will sort your character accordingly or request you to change your profile for any reason deemed fit. Want a friend? Companion? Love interest? Or do you have the need to make enemies? Post here and brainstorm with others to create plots for your characters. What happens here does not effect your character until it has been played out on the forum. Forests, trees for miles, spread out across the great plains and over the hillsides, dense and green, filled with the wildlife of the lands. This is the stomping ground for Wolves on the hunt, various packs sharing the lands and not all of the time, can civility last. Certain of this, you will roam these woods and surely find an interesting journey beneath the leaves and distant rays of sunshine. Surrounded by Dense Forest and Bush, this large Inn is the only stopping ground between the nearby Township and the Wolven Territories. The Wilds have made trekking here a difficult journey though some people still frequent enough to keep this establishment afloat. Here you can find lodgings, a flagon of Mead and even listen to one of the local Bards, singing and keeping spirits high. This is by no means a harsh place, the rooms are well priced and the air is warm, welcoming to the tired traveler seeking refuge from the cold winter nights, outdoors. The Aedaira Rapids are widely known for their heavy waters, deep and rapid running. The strongest of swimmers find it difficult to navigate these plains though the smartest of creatures might use the oddly convenient placed boulders to jump from side to side. This river separates the southern from the northern woodlands and is the only way to cross into the heart of the woodlands. To the east, Mountains run along the tooth of the continent right up until Cape Arvenshore, closing the area off from sea faring travelers. Rendezvous - otherwise known as a place of meeting in Aedaira, this is the clearing on the south western side of the Aedaira Woodlands. The Cliff face at the edge of the land drops far down below into the southern oceans, giving this area a very isolated birth and only being able to find it through the trees of Aedaira. It'd take a skilled tracker to get here, should they be foreign to these lands. Situated far on the Eastern side of Rapacity are the Eastern heights, otherwise known as the Ascension plains. Here rest the Mountain heights that tower atop the world below, some scale these Mountain Rockies looking for adventure, others looking for enlightenment and inner peace however if there's one thing known about these mountainous lands, it's that Wild Cats flourish amidst these lands, searching for food and feeding their own, the supply for nourishment is scarce and even the smallest of the Wild are bold enough to take on those bigger than themselves. High atop these mountains, scaling the ravenous slopes of the Eastern rockies is potential more a burden than it's worth, for the ground is narrow and the chance for land fall far greater with little support from the heavy winds. High east, hidden behind the mountain lands, the mouth of a long since forgotten and neglected cape can be found, filled with the wreckage's of old ships, caught on the reefs and rocks protruding the waters surface. This is a ship graveyard, who's beauty on the eastern side of the mountain has caught the eyes of sailors lured here by the promise of valuable minerals such as Gold and crystal, a risk only taken by the hearts and minds of greed. The minds of Men. This is an Isolated Island off of the coast of Rapacity, it's uninhabited by any specific group, pack or breed and as it's so difficult to reach, it may likely never be. Why is this significant? Because if someone does manage to make the distance, one would hope they realize the importance of peace in such an unpredictable world. The Southern Islands are significantly smaller than the main though none less worthy of exploring. There is evidence of former human residence to be found within as several facility's of military kind have been abandoned and nature allowed to overgrow through out them. No human presence is noteworthy nowadays and only the animals live and flourish here, a true lack of predators giving free reign to the less hostile life such as Deer, Cow, birds and more. Area 69, the once heavily populated equivalent to Area 51 only this Military base never even met the mouth of rumors, let alone survived the winters of AmberMyst Isle. As the island froze over, so too did it's inhabitants before being picked away at by the birds and wild life brazen enough to walk the paved floors of this extensive facility. What remains, hidden beneath dust, cobwebs, overgrowth and moss, are things only the humans might utilize and secrets only valuable to the long departed. Cape Still-Water or otherwise known as the Shallows, for good reason. The Water here doesn't reach further than the shoulders of any Average sized Wolf, due to the closeness of the Land surrounding this walkable Lake. Still-Water provides the best opportunity for fishing but also brings the risks of the Bears coming down from the Forests nearby in search of the same. Be on your guard should you meet one of these monstrous bears, for the Grizzly is not a foe you want to fend off lightly. The farthest stretch of land visible on a single plain. The sands are flat, absent of hills and turns, running the northern miles. It's unclear what makes the sand here so white or why the wind seems to feel unwelcome across the beaches but there's truly something magical in the way that when you walk upon these lifeless dunes, feel the nature around you here, all your worries seem to drift away and the Northern Plateau feels like you were meant to be there. As if this is a sanctuary from the rest of the World and from all your worries. The highest point in all the land named for the phenomenon of lights that dance across the sky on some clear nights. A narrow trail leads up the snow covered mountain via switch-backs. The temperature drops during the night and never reaches above freezing during the day which means the snow is always present on the mountain top. In all things, life brings reason and in this vast Lake, surrounded by the tree's of dense forestry, it is no exception. A tale follows the name for this beautiful place. A tale of two mortal lovers, fled here from their sovereign families so that they might live peacefully in their love for one another. The Man, a Baron, the Woman, a princess in his eyes and though he devoted his life to her, she gave him her blade in the dark quiet of the night. No one has ever foretold why the woman may have killed him in this legend and not once, since, has the mist risen up off of the waters surface since. The only evidence of any residential living here is an old burned down cabin, overgrown with moss and shrubs over the many years it's sat, untouched. This is a hallowed ground for the men and women of the land, and as such, the perfect peaceful place for the Wolves to venture out to, for peace of mind and the calm of the heart. The Marshlands or otherwise known as the Swamp lands, fill the initial part Barons Fall on the North Easterly side of the massive lake, these swamps consist of High grassy knolls which make for explorative travel, not being able to see a foot in front of the other. Naturally the birds flourish here, seeking easy living through muddied waters of worms, small fish and other sources of food. Because of this however, the smaller cats seek the same and often come here to scout for a quick fix. What once use to be a massive and beautiful lake has long since dried up and sunken down into the earth, leaving only dried ground and vast miles of sand, a desert remains, barren and unforgiving. Only the Strong survive here and few manage to escape these plains. Dunes as far as ones eyes can take them, do not underestimate this land, it could inevitably bring you to your knees before your maker. In the center of the expanse there is a forest, but not a living one. Where were once living trees now stand as foreboding, hallow refuges for the life of the desert seeking shelter from the unrelenting heat of the day. Hidden away in a rocky enclave in the desert lies a beautiful desert, sustained with fresh water provided by an underground water source. Sandstone grottoes provide shelter from the blistering heat while a few plants sustained by the water harbor fresh fruit for any who are seeking sustenance. Once the port of the human civilization, now lies a quiet and unoccupied town, beaten and run down, unattended by any other than the wild way of the world today. Many private beaches surround this open expanse of water, the Port encircled by smaller isles making it feel like a welcoming place to set up and live within, in some sort of funny way. The Islands surrounding the cape are all well protected by dense forests and open waters. Waters are guarded by reclusive sea life with secrets of their own. The region is yet to be claimed by any of the Packs so all is fair game, go hard and have fun or go back home. The Heart of the Wilds does not only belong to those of fearless minds but so to those of questioning nature, Exploring for as far as the eye can see, these plains would make a welcome journey for those with the gull to leave their comfortable homes and seek an adventure for themselves and those fair friends that might be willing to join them. Many different breeds of animal roam these lands, Wolves venture freely here, the game is lush and hunting seems to be a popular sort by all willing to prove themselves or to feed their own. Whether you seek a quiet walk in the grassy knolls, or you're tracking a herd of deer, you may well consider passing through these lands just for the scenery alone. The River system that the lands named after and well known for, this river is near impossible to avoid as it scales the entire western side of the continent, running through out the forests, across the hills and mountains to join either side of the oceans together. These waters are dense with Falls and rocks that give birth to varying rapids though for the most part, the majority is calm and even tranquil, attracting all kinds to it's not only 'easy on the eyes' appeal but so to it's fresh 'mountain spring' waters. South Lance Briar, a Quaint yet smaller settlement of the land. This is a peaceful town-stead of Farmers and Commerce. The Village itself seems rather large though the population is small due to it's less than popular reputation of living so close to the Wilds and thus, risking a portion of their safety to the Animals that wander further into their home. While predators are fended against with the utmost aggression, the humans here have a certain mentality about life and the nature around them, most of them wanting and even choosing to live alongside the animals rather than against them. While hostilities between this settlement and the wildlife do happen, it's only in the protective nature for their children and families that they rise up to fight for their lives and unbelievably, they seem to be given a harder time by the other humans of the mainland than the beasts of the woods. It's certainly something curious to question just how trust worthy these people might be, and just how much potential they have in being a friend to any such Wolf or animal, as we all know, humans have a violent nature about them, like it or not. Follow the rules within this board to be affiliated with Catalyst! A staff member will accept/deny your request and they will lock the thread afterwards Guest Friendly!